A powerful explosion has ripped through a house in the Indian state of West Bengal, killing at least three people. A police chief said the dead have not yet been identified, but that they may be Tibetans. The owner of the house, in the town of Siliguri, said that it was rented by a Tibetan exile who said he was using it in connection with a computer business. But the police maintained that after the blast they recovered a large quantity of explosives and detonators. They say that timers were also discovered. Police said those killed were perhaps members of an underground group who had rented the house by providing false identities. The BBC's north-east India correspondent says that Siliguri - in the north of the state of West Bengal - has been used as a base or transit point for a number of rebel groups. Local Kamtapuri tribesmen who want a separate state in northern Bengal are believed to have a presence there, as do Nepalese and Indian Maoists. 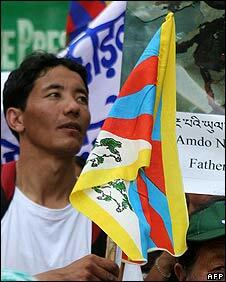 Tibetan exiles have a huge presence in the town and in the nearby hills of Darjeeling and Kalimpong.